The Danish billionaires who are now Scotland’s largest private landowners are trying to restore the Highlands for generations to come, one of their closest advisers has said. Tim Kirkwood said that Anders and Anne Holch Povlsen, who own more than 80,000 hectares (200,000 acres) across Sutherland and the Grampian mountains wanted to become pioneers of rewilding by reversing years of mismanagement by previous lairds. Related: ‘It is strange to see the British struggling with the beaver': why is rewilding so controversial? Along with other major landowners, the Povlsens, reputedly worth £4.5bn from Anders Povlsen’s clothing empire, including the largest shareholding in the online retailer Asos, face fresh pressure to justify their dominance after a new report to ministers on Wednesday. In a report for the Scottish government, the Scottish Land Commission said the heavy concentration of land ownership in a small number of hands, including private owners, charities and government agencies, constitutes a monopoly, which undermined the public interest. It has recommended new legal powers to subject land sales to public interest tests and to investigate abuses of power by landowners, as well as requirements for owners to publish management plans. The Scottish parliament is due to debate the proposals this Thursday. Kirkwood, chief executive of the Povlsens’ company Wildland, based in Aviemore, said they understood the concerns raised by the commission but said their agenda was in the public interest and met many of the commission’s new tests. The Povlsens, who rarely give interviews, believe restoring the Highlands after several centuries of damage from overgrazing by sheep and deer needed to be carried out on a significant scale and over several generations. Breaking up their estates would be counterproductive, Kirkwood said, as merging neighbouring estates and creating a single master plan for that area made it far easier to reverse that damage, and have a consistent strategy for the future. In Sutherland, the Povlsens have acquired five neighbouring country sports estates between Ben Loyal and Eriboll, close to the town of Tongue, as well as several stalking estates further south such as Glenfeshie, the couple’s home in the Cairngorms. Many include luxury holiday and hunting lodges for rent. The change of use involved removing sheep and the intensive culling of red deer – which previous lairds had allowed to proliferate to promote gun sports – to allow native woodland and species to regenerate and flourish. At Killiehuntly near Inverness, they have planted 1.5m native trees. Kirkwood said the Povlsens were also investing money in restoring homes and supporting community businesses, and agreed with the commission’s goal of ensuring local communities have a direct say in the management of rural estates. It had shown its management plan to the commission. “We wish to be at the leading edge of this and deliver the benefits which we believe are there for both parties in this relationship. We wish to embrace that,” Kirkwood said. The land commission’s report raises new tensions about the future of conservation policy in the Highlands. Many conservationists support landscape-level rewilding projects of the kind the Povlsens are pursuing, as it can make protecting threatened species such as golden eagles, wildcats, red squirrel or capercaillie easier. Scottish Natural Heritage, the government’s conservation agency, is watching the Povlsens’ experiment closely. 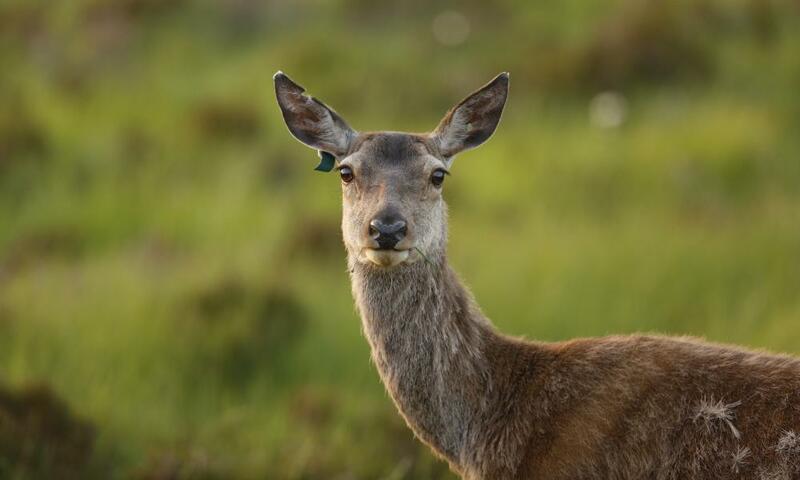 It is battling to heavily cut Scotland’s booming red deer population but faces significant resistance from deer estates who do not want to cut deer numbers, fearing it will harm their stalking businesses.